Many of the workshops I do are as Arts Republic, the public art group I co-founded with partner Molly Fletcher. These are usually making moving things if there are enough days, such as wind sculpture and automata. But we can do one day workshops/events such as our solar powered Florascope & Energy Garden which works well at one day festivals. In 2008 I participated in Kinetic Tate, a day of events relating to movement at Tate Britain (This was when they were showing artist Martin Creed - his work was an athelete running around the galleries). 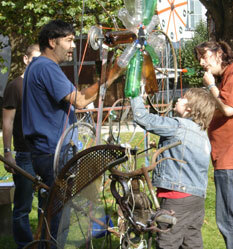 The workshop was held on the front lawn inspired by his drawing of Tinguely’s Homage to New York - the famous self destructing piece he performed in New York in the 1960s. It was one of the most exhausting days and although fascinating experience, I realsied that doing free-from kinetic art with the public was not a good idea and it was lucky no-one got injured.